Health	Anthelios XL Fluid Extreme SPF50: An Effective Sun Solution? Fitness	Relax Holy Basil Review – Does it Work? Health	Maximum Prostate Review: Is it the real deal? Pregnancy is one of the most critical events in a woman’s life — the entire journey of having a baby, starting from the first trimester until the delivery can be overwhelming for a woman; both physically and emotionally. As for working women, the journey reaches an entirely different zone altogether due to the need for managing work and pregnancy. Working while being pregnant is more common than ever now. More than 75% of pregnant women work during their pregnancy period. This is more than 35% when compared to the numbers 20 years ago. It has to be considered either positively or negatively. The positive aspect of more and more pregnant women working symbolizes gender equality and women trying to be independent during a natural phase of their life rather than making it an excuse to show weakness. On the other hand, a lot of women had to work during pregnancy due to financial constraints or stringent policies at the workplace. Nausea is one of the biggest headaches of every pregnant woman. The hormonal changes can make you nauseous in the morning (sometimes, all-day!). It is essential to manage this situation by taking healthy food, not keeping an empty stomach, bringing enough snacks to work, and taking prescribed medications, if needed. Nausea can especially be extremely uncomfortable for working women as it can trouble your work hours. Ginger tea can be a useful item to deal with nausea while at work. During the pregnancy period, one of the worst nightmares for women is fatigue, especially in the first and final trimesters. Even if you are a super healthy woman, fatigue is going to strike you. Sound sleep, therefore, is essential to get through the day without any difficulties. Compromise on staying up late and hit the bed as soon as possible at night. Avoid going out late for dinner or parties and ensure 8-9 hours of high-quality sleep. Taking frequent naps during daytime can also help you to cope up with fatigue. As your body changes and hormones flare, you will experience mood-swings and emotional outbursts frequently. The work pressure and office environment can make them worse. So set boundaries with everyone and everything that doesn’t make you feel comfortable: a cranky boss, nosy co-worker or anyone for that matter. Open up about your feelings and confront people who are making you uncomfortable. Sometimes, a simple ‘NO’ can solve most of your problems and make our pregnancy period and working hours much better. The first trimester is one hell of a roller-coaster ride because of emotions, breaking down in tears for no reason and hormonal changes. Adding to this, your work can mentally affect you severely. Studies show that taking too much emotional stress during this period can put the baby and mother at considerable risk. So, let your co-workers know about your pregnancy because, during this time, you won’t “look” pregnant. Explain to them what you are going through and ask them to cooperate with your powerful emotional state. Physical activity is of paramount importance during each stage of pregnancy. If you do a 9-5 desk job, the physical movement may get limited. Sometimes, you may not feel like moving around due to fatigue or other issues. But try to get up from your desk and walk around at least once every hour. Your body’s center of gravity changes as your pregnancy progresses as your weight is increasing and your posture is changing. Being idle for long hours would cause muscle cramps, swellings and back pain. Get a stool to fit under your desk as a comfortable footrest. Also, during the final trimester, you would want to use the restrooms more often so make that as an excuse to move around frequently. Due to your rapidly changing hormones, pregnant women tend to experience brain fog and forgetfulness during pregnancy. This might seem irritating and scary at the same time. There is nothing to worry about it as you would come back to normalcy after delivery. But make sure you put essential calls and meetings on your calendar, set appropriate reminders for deadlines at work so that you can feel less stressed and more organized. If needed, seek your co-workers help on essential tasks. However busy you are, whatever is it that you need to get done at work, ensure to not miss the doctor’s appointment at any cost. They are there for a reason. Your body is changing faster than ever, and it is essential for your doctor to keep track of it. Missing doctor’s appointment can cause your doctor to miss any vital health issues that you experience. It is inevitable to get nervous thinking of the day! But there is nothing to worry as your water will not break that easily. However, you can always keep some towels and thick clothes handy at your desk, in case of an emergency. 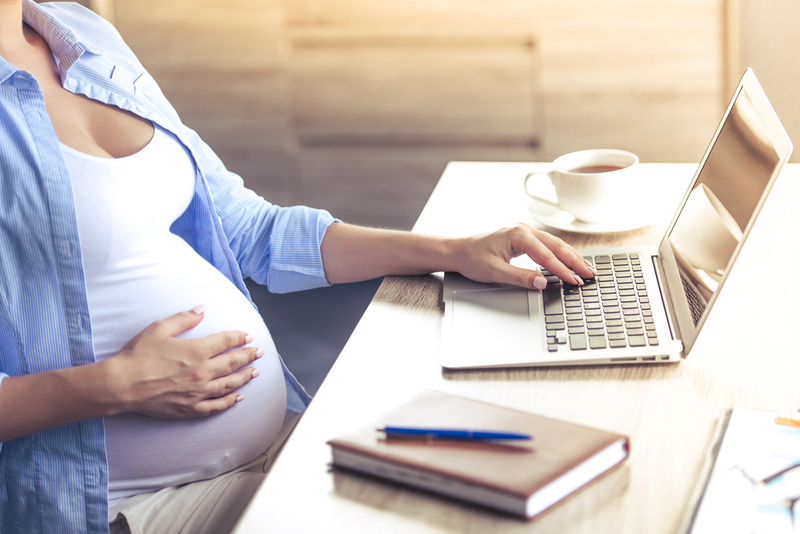 Working while being pregnant can be a hard challenge but taking necessary precautions and safety measures can help you get through the nine months without much struggle. Following these tips will also help to be productive and independent in the workplace while taking care of your body and your baby. There is no shame in seeking help from co-workers as most people can empathize with what you are going through without explaining. Get proper sleep, eat healthy food and stay active in order to make work-life balance function efficiently in your favor during those nine months.